When you find yourself in a pickle and need to think quickly about what you'd do? I'm reminded of the Disney movie Finding Dory. 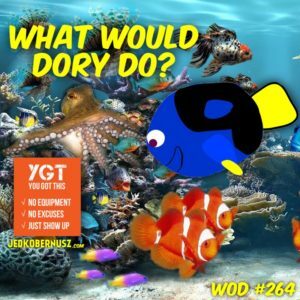 Ask yourself this question: What would dory do? You could even simply be more like Dory and think from your heart instead of your head. Having a plan is great and all, but leading with your heart is way more exciting. Finding your inner Dory will help you become happier. Be more like Dory from Finding Nemo and Finding Dory. Dory doesn’t overthink anything. She just does. The story of Dory is a perfect representation of what people who are most successful aspire to be like. That’s what you can ask yourself when you start overthinking your options. If you've ever seen the movie I'm going to give you a chance to not read the rest of this until you do, but Spoiler Alert. There's a great part in the movie where Dory is trying to convince Hank to get out of his tank and be free in the ocean with them. Hank is scared because he hasn't been in the big blue sea for many years. There are many unknowns in the ocean. Dory suffers from short-term memory loss and yet somehow she has survived so much. Now, this is a fictional story by Disney and Pixar, but there are so many of us who can relate. Hank is scared and rightfully so. Because he has been in such a “safe” environment for so long he forgets how to just live. He also forgets how to just be. Thinking and being from a place of love and curiosity is what we all use to do as children. In this movie, I teared up each time I saw Dory thinking and being from her heart. It reminds me that we all can be more like Dory. When we overthink things we start to turn on the survival part of our brain. We instantly go from cool, calm and collected to the fight or flight mode. As humans, we can stay in this mode for days, weeks and even years. Therefore, stress can wreak havoc on our bodies. We turn on neurotransmitters that don't need to be turned on. Living in constant stress is exhausting. Can you imagine if we had to worry about beating our own hearts? I know I've talked about this before, but it's worth repeating. If you had to worry about your heart beating and your lungs inflating and deflating, you'd be dead in a matter of minutes. Why? Because we overthink everything. The autonomic nervous system has that responsibility. By asking yourself what would Dory do? Provides a moment of breath. A moment of relief. If you simply stop worrying about things you cannot control you will move from a place of worry to a place of fun. Finding the fun in every moment of every day is what I challenge you to do. It takes practice at first and can be scary. Crossing over into the place of fun and play is what life is all about. We only have so many minutes to live and in our lives, why spend them in stress? 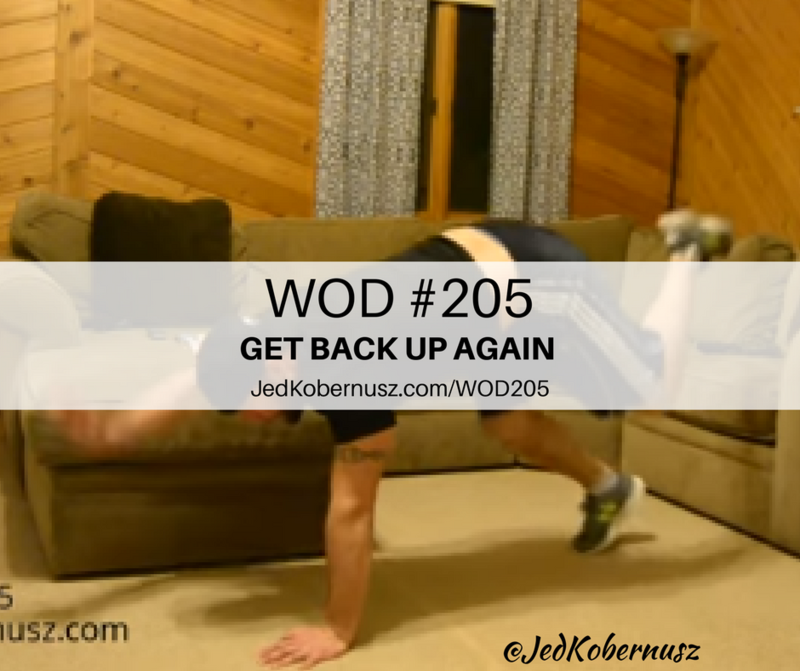 Today's WOD is one that will challenge your balance and your thought patterns of what you're capable of. Simply put, it's kind of a hard workout, but not impossible. PSS: If you found this WOD provided you value, then consider giving an At-Will Offering. Because then I can keep helping. Go Here To Give. Thank you for your time, attention and generosity. Because I do everything at no cost to be 100% right, please consider sharing this post. However, if you feel like a comment below is better I'm good with that too. Also, if you're looking for the best Personal Trainer in Roseau MN, you found him. 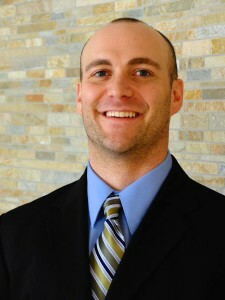 Jed can modify any workout to fit your Fitness level, injury and/or ailment. I think sometimes the hardest concept for you to understand is cardio has balance. Understanding cardio has balance is one of those things that you don't exactly have to be on a machine to achieve cardio. Balancing out your movement patterns can be difficult, but increasing your awareness is key. Today's workout definitely helps with increasing your awareness, strengthening your cardiovascular system and your increasing your balance. Understanding cardio has balance in my opinion is understanding cardio isn't just being on a machine for hours at a time. In my opinion it is one of the most hardest concepts that people I work with conceptualize. I think where we get confused is that we have to do it in a formal way. But to stay committed to yourself is what you are doing here. Then try to repeat the process until you can do 6 days a week. So my offer to you today is give yourself permission to do at least one round and and be proud of that. If you enjoyed this post about Understanding Cardio Has Balance , retweet and comment below please. When we think about emotional stress, do we think about an elevated mind to balance emotions for our own self? There are certain types of stress that really elicit some very strong emotions. What are good stress relievers for stress? There are certain stress symptoms that you can really increase your awareness of and every day you can practice to increase that awareness for those symptoms. 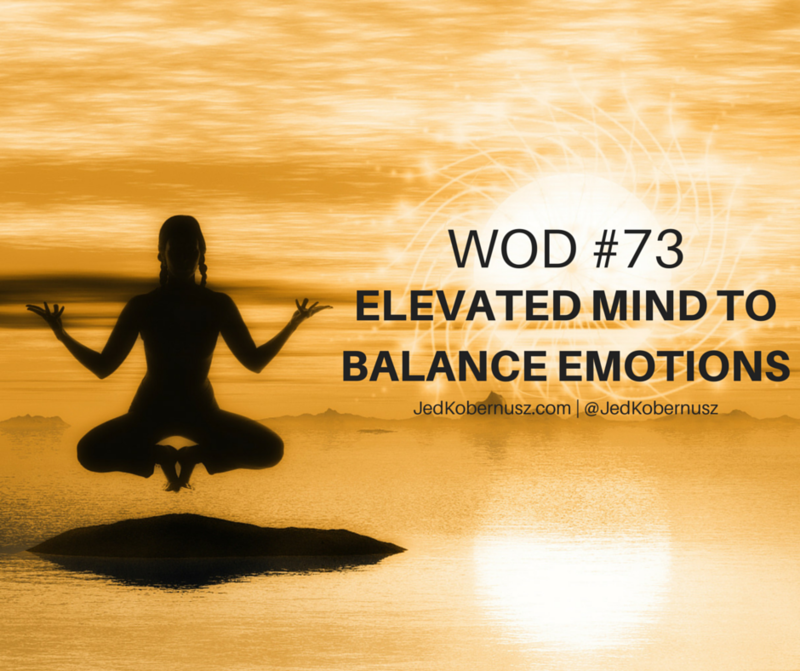 With today's WOD you really do elevate your mind to balance your emotions. Both figuratively and literally speaking. But in all reality it is literally up to you so my offer for you today is to do something again that is different in both your mind and your body. Now, those stress symptoms are usually weight gain, increased anxiety, increased depression, low energy and many others to go with it. Because what you're really doing is you are putting yourself into a state of high anxiety. So when you take yourself that for you purposefully go through those motions and the best part is you get to CHOOSE to stop the increased anxiety that is going on. Elevated mind to balance emotions will help balance those emotions. This is not easily obtained. That's why constant practice every day can help the effects of stress and balance out your emotional state. And be sure to check out the video below because that's what I do. Check out what Google has for this topic of Elevated Mind To Balance Emotions… Go Here For That. Also, I had an AWESOME Talk Therapy session… Go Here To Hear ALL About It. Get as many Rounds as you can finished. Balance and boxing is something we all can work on. If you cannot get 6 rounds done that's no problem. Try to think about it this way, at least you are ABLE to DO some or most of it!! Let's be grateful for that! Also, let pain be your guide. If you have muscle soreness be aware of it and push through it a little, but not to the point of damage or injury. Having joint pain? Then STOP, re-evaluate your weight, angle or positioning of your body. If you try the exercise again with joint pain still being present, then skip that exercise, there is NO harm in that. This is a TOTAL BODY workout!! Was this workout on Balance And Boxing helpful? Feel free to share with your friends if you got value. I would love to hear from you to know which part hit you the most. If you enjoyed this post about the Count Down To Greatness , retweet and comment below what was most noteworthy please.